With it being in our slowest part of the year – portrait speaking – I have realized just how much joy our portrait sessions bring into my life. The weather has been dreary, everything is dead, and with it, my mood. Taking Callie’s first birthday portraits this morning at the Walburn house actually made my entire week. Y’all don’t understand how much happiness I get seeing my portrait families and catching up with them over these HUGE milestone events in their lives! It’s like someone lit a fire inside my heart again! We’ve been honored enough to take Jessica and Corey’s maternity portraits, Callie’s six month portraits, and now she’s turning ONE next week!! Seriously, how does time fly so fast?? Watching this little girl grow up and seeing Jessica and Corey as they mature as parents has been truly a blessing. 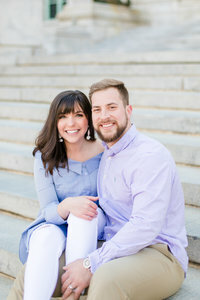 I joked during their session that I feel like I should get “Aunt Andie” as a title! Jessica and Corey came up with the CUTEST first birthday donut smash idea to celebrate little girl turning the big O-N-E! and I don’t think I could have planned a better one myself!